Iowa: Gun Show Schedule for the Fall of 2015! Now that the harvest season is wrapping up, it’s time for Iowans to turn their attention to the next season in the year: gun show season! That’s right, gun shows are happening all over the state and Iowa Gun Owners will be attending many of these shows – giving you the chance to get involved in the fight to defend the 2nd Amendment here in Iowa. 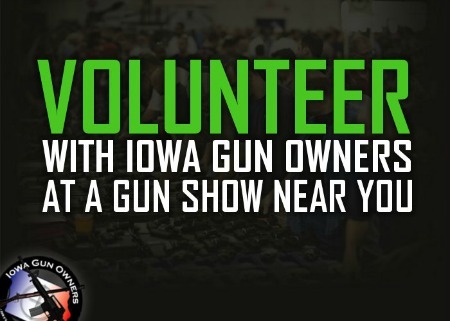 Whether you want to join IGO and get a FREE T-Shirt in the process, pick up a FREE decal, grab a fistful of FREE “No Guns No Money” business cards to hand out, or just want to sign your Stand-Your-Ground petition to the Iowa legislature – you can do it all at a gun show near you! While we’re still finalizing our 2016 gun show schedule, I wanted to make you aware of the shows that I know we’ll be at between now and the end of the year. Please note, our next show will be THIS WEEKEND! This is only a partial listing, as we’ll be adding many more shows heading into 2016. I really hope you come out to a show near you and get involved. 2016 will be a crucial year in the fight for the 2nd Amendment in light of the Fall elections. We need all hands on deck! If you want to get more directly involved in the 2nd Amendment fight and would like to volunteer for a couple of hours at a show near you, we’d be honored to have your help. What’s more, if you can give us 4 hours of your time, we’ll pay your admission to the show and give you an IGO T-Shirt and hat for FREE! To get involved, please click the link below and select the towns and time slots that work best for you. Someone from our office will be in touch. I hope to see you at a show! P.S. It’s gun show season in Iowa, and Iowa Gun Owners will be attending shows all over the state in an effort to mobilize as many gun owners as possible into our 2nd Amendment fight as we head into 2016. Above you’ll find a schedule of the shows we’ll be coming to during the remainder of 2015. This weekend we’re coming to the Mason City show, being held in the North Iowa Events Center. We’ll be out there Friday from 4pm – 9pm and Saturday from 9am – 5pm! We’d love to have you come by and grab a FREE decal, sign your petition in support of Stand-Your-Ground legislation, join IGO and get a FREE T-Shirt, or pick up some FREE “No Guns No Money” business cards. What’s more, if you can volunteer at a show for 4 hours, we’ll not only pay your admission to the show, but make sure you leave with a free IGO T-Shirt and hat as well! If you’re interested, please sign up below and someone from our office will be in touch. Victory in Kalona – for Now! Iowa: North Liberty is Trying To Disarm You at Tomorrow Night’s Council Meeting!